Thomas returned to Australia on the 16thMay 1919. Discharged on the 12thAugust 1919. After the First World War, Thomas lived in Campbell Street, Berwick. He married Violet Mary Poole. Thomas then enlisted for World War Two and served 26thJune 1940-6thOctober 1945. After his second military service Thomas moved to Bendigo. Died in February 1974 at Bendigo, Victoria. Buried on the 25thFebruary 1974 at Eaglehawk Cemetery, Bendigo, Victoria. 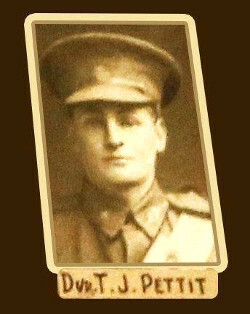 “At the recruiting meeting held at Beaconsfield on Monday evening three young men handed in their names; Messrs J Edmundson, Pettit and Tulk.